Martha’s Vineyard is a beautiful Island, a kind of glorious accident of nature. It’s a thriving, vibrant community, a mix of races, classes, and creeds, especially welcoming to presidents. What makes the Vineyard special, what attracts people to it, is that natural beauty and it’s mostly forgotten now how close the Island came to ruin. Forgotten also is the identity of its benefactor: Sen. Edward M. Kennedy. In 1971, three of the Vineyard’s six towns had no zoning, and the other three towns had zoning in only a small portion of the towns. There were no planning boards and no protective environmental regulations. The Vineyard had been discovered by developers and was in the process of being overrun. The mere filing of the legislation had the political impact of an atomic bomb. Town officials swiftly and effectively undertook the process of enacting their own local zoning enactments and environmental regulations so as to avoid Federal legislation. By the end of 1973, all six Vineyard towns had adopted sweeping land use regulations. The entire south shore of the Vineyard was zoned three acres — the largest lot size which has ever been upheld by the Massachusetts Supreme Judicial Court (which it did in 1997). At the state level, Gov. Francis Sargent introduced a bill in the Massachusetts legislature to create the Martha’s Vineyard Commission, a super zoning body with powers to impose regulations on areas deemed environmentally critical and to regulate large scale developments. 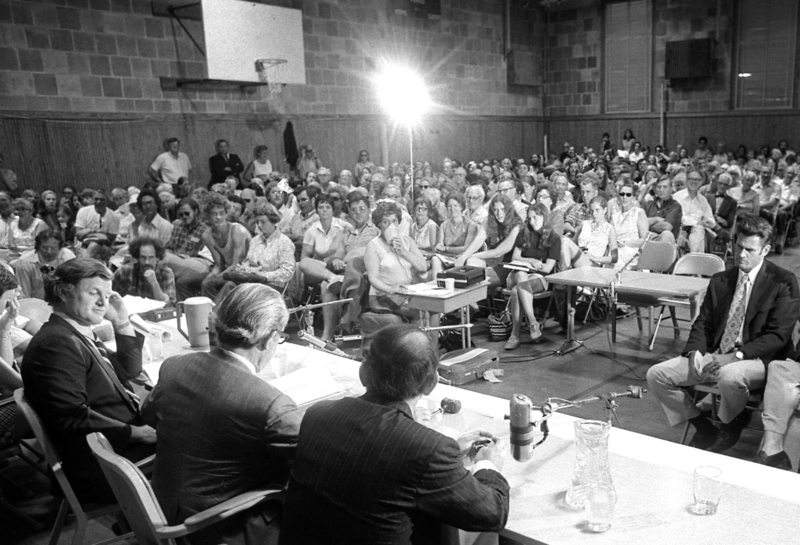 In 1974, the Martha’s Vineyard Commission came into being, consisting of nine members who are elected Island-wide, six appointed from the towns, and others appointed by the Governor. The Martha’s Vineyard Commission has adopted numerous comprehensive land use regulations involving the most environmentally sensitive areas of the Vineyard and has been responsible for regulating and controlling large scale development. Massachusetts courts, in ruling on land use challenges, have consistently rejected developers’ challenges, citing Senator Kennedy’s Island’s Trust Bill as a reason why the preservation of the unique character of the Vineyard serves a larger public interest. In my opinion, none of this would have happened without the courage and foresight of Senator Kennedy. How do I know this: I was working in the United States Senate at the time that Senator Kennedy filed his legislation, and I went to several of the hearings which were conducted on the Island’s Trust Bill. Officials of the Nixon Administration, including Attorney General Mitchell, were publicly critical of the legislation, claiming portions of it were unconstitutional. But Senator Kennedy persevered. When visitors come to the Vineyard today and marvel at its physical beauty, whether they are the President of the United States or an ordinary citizen, they have Senator Kennedy to thank. Ronald H. Rappaport is an Edgartown attorney and town counsel to five of the six Vineyard towns.